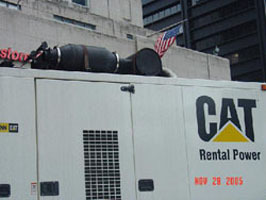 Various portable diesel powered gensets, operating in a downtown urban environment Manhattan, New York City. The gensets are used for powering construction equipment in a subway expansion project. The diesel particulate filters were required to meet local standards for particulate reduction. The units were expected to operate maintenance free despite the low exhaust temperature and duty cycle of the portable gensets. 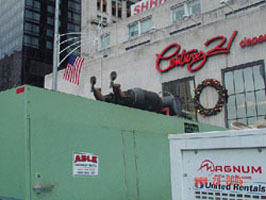 DCL delivered several diesel particulate filters for portable genset applications in New York City. All diesel particulate filters are operating successfully, achieving passive regeneration without the need for regular maintenance. In addition to a particulate reduction of over 90%, the noise level was equivalent to that of the original muffler. The photos above show the rain caps are open, indicating the engines are running and exhaust gas is exiting the units with no visible sign of diesel soot.